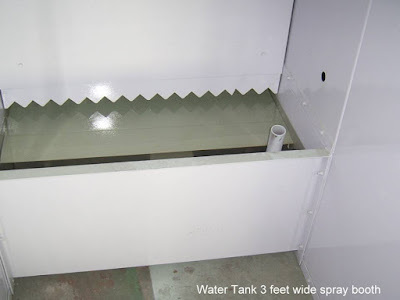 The Spray booth is designed to maintain an adequate velocity of clean air at the operator’s breathing level and ensure that all the over spray paint is sucked into water tank. By keeping the operator’s breathing level free from solvent and over spray paint, it is .possible to make the operators work continuously for longer periods, thereby increasing production and improving the quality of work. Bullows make Spray painting booth is suitable for all kind of components and different products. The spray painting booth is on simple construction, easy to install and maintain. Normally our Paint booth are made up of MS, GI, SS as per customer Spray paint application and requirement. 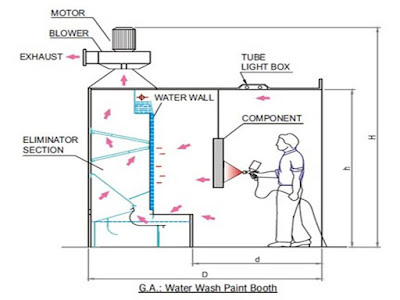 An enclosed or semi enclosed area used for the spray painting of component may be equipped with a source fresh air to keep the atmosphere dust-free, a waterfall backdrop to trap over spray, and an exhaust system to vent the fumes of the evaporating solvents. To provide clean air at the operators brathing level. To collect overspray & to exhaust clean air. To treat the overspray in such a way that it can later be disposedof outside the building without nuisance or hazard. To reduce fire risk to minimum in spray shop. The main advantage of this type of paint booth is that over sprayed waste paint is collected in the water tank which is below of curtain, so that it will be helpful to user to collect it easily. Made with SS 304 fabricated (or MS/GI) in leak-proof construction & with drain system provided. Tank size is depends on the size of booth. 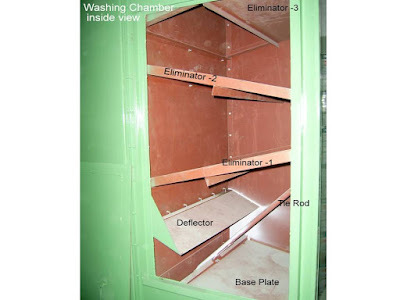 2.Washing chamber – Consists of Base panels sheets with integral flanges. Back, front and top panels : sheet with integral flanges and reinforcing strips and End panels: framework with removable access door/s. Generally we provide GI or SS as per customer requirements. Eliminator plates– Sheet on angle framework supported by sheet easily removable for cleaning & maintenance. 5.Water circuit – Water is entrained and carried directly into the washing Chamber due to the high velocity of air between the Distributions Plate and the water level.After traveling a tortuous path inside the washing chamber, the water falls into a galley at the base. From this a return channel is provided to bring back the water to the front of the tank. Water treatment –Improved water treatment is made possible by the use of booth additive to the water. The first and most violent contact between the paint or the resin Particles and water takes place at this point. Particles are immediately coated with additive. This prevents the particles coagulating so that each particle exposes its entire surface area to alkali attack.This makes for a very high rate of resin saponification. As the Process continues the resin becomes fully saponified and the only solid matter left is the pigment. This sinks to the bottom of the tank or float on water surface in tank as non-sticky silt. The only major maintenance on the booths is the removal of this silt at infrequent intervals. Blower –Blower selection is depends on the volume of booth considering .4 to .5 m/s air velocity inside of booth. 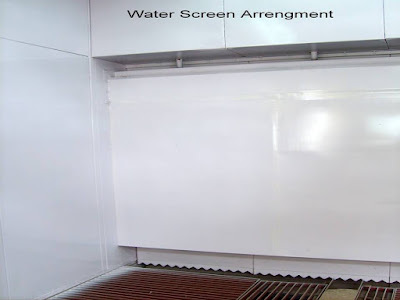 In wet type of Spray paint booth we suggest water contacted parts like curtain, tank also sludge removal tank are in SS to avoid feature corrosion problem. No Pump Spray paint booth principle is different. There is no water screen and no pump. Instead of it, fan creates high velocity air stream across the surface of the water tank. This cuases the surface to shear & liquid is entrained by the air. Overspread is drawn into this air/liquid mixture and violently scrubbed in an area of extreme turbulence caused by sharp changes in the direction of the air/liquid stream. Since there is nothing to be become clogged, the resin particles are encouraged to recirculate so that they can be scrubbed, again & again. Eventfully the resin is completely broken down. Pigment sinks to the bottom of the washing tank as a non sticky silt which is relatively easy to dispose of.